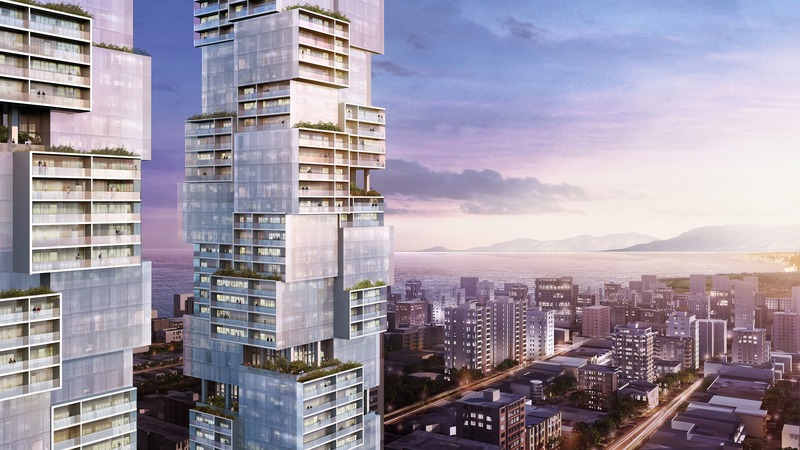 A sensitive insertion into an existing neighborhood in Vancouver’s West End and a design that promotes social cohesiveness in a dense urban context. 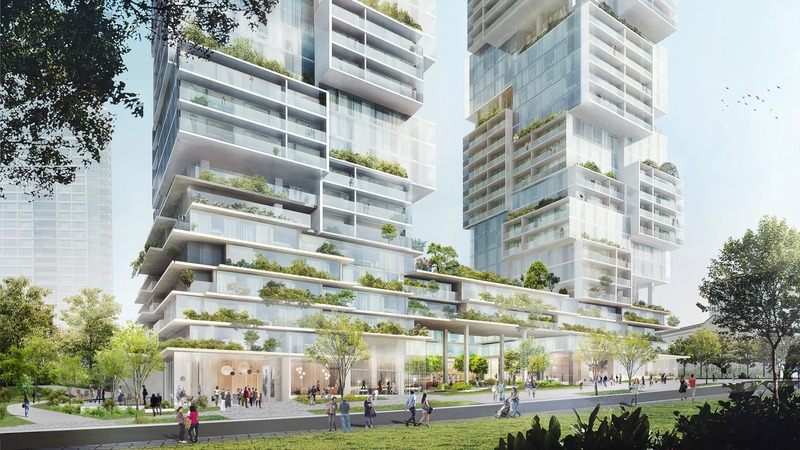 Barclay Village is embedded in Vancouver’s lively West End, an area characterized by a range of small and medium-scale structures and a patchwork of dense green spaces. 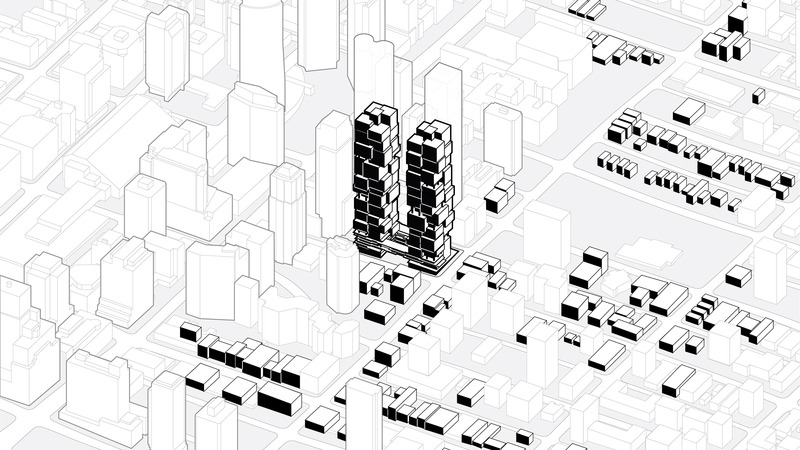 The design of the project reflects this heterogeneous urban context by stacking cubic volumes of varying size to form two modulated towers with a distinctive silhouette. The volumes are offset to create multiple receding platforms, balconies and terraces that resemble the network of diverse small-scale spaces at street-level. Barclay Village creates a living experience in a high-rise comparable to that of the surrounding neighborhood, affording both private residential spaces and a variety of communal areas for social connectivity. 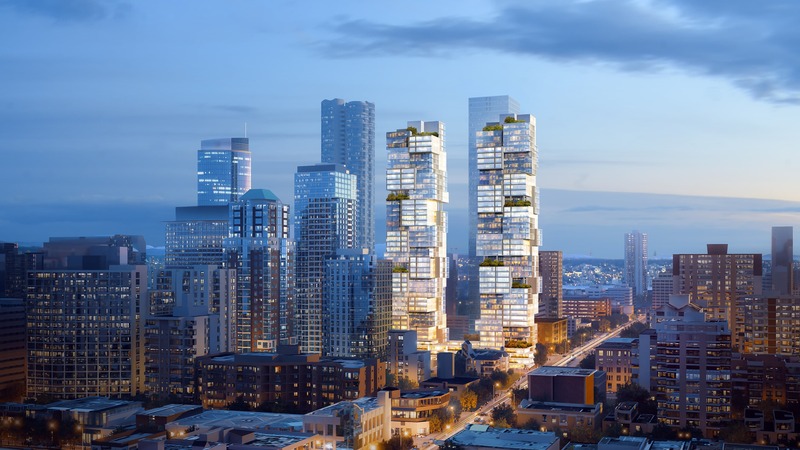 Located at the midpoint between Vancouver’s bustling Davie and Robson Villages, the design for Barclay Village draws inspiration from the texture and scale of the surrounding urban fabric and folds the typologies of the two historic villages from the horizontal into the vertical, creating carefully articulated twin towers that integrate into the local neighborhood. 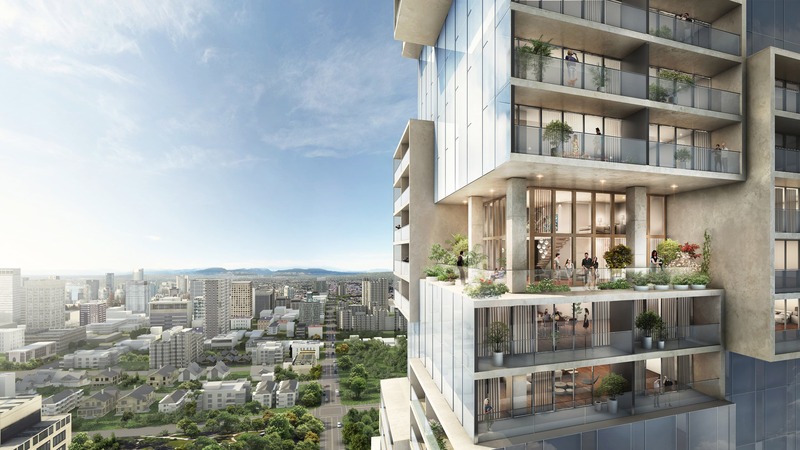 The project merges a diverse mix of residences with public amenities, communal spaces and a network of green areas that extend to the building’s top floors. The development integrates social housing, alongside market rental and condominiums for sale in a residential complex that goes beyond the stratified apartment block and offers a multitude of shared spaces for social interaction. 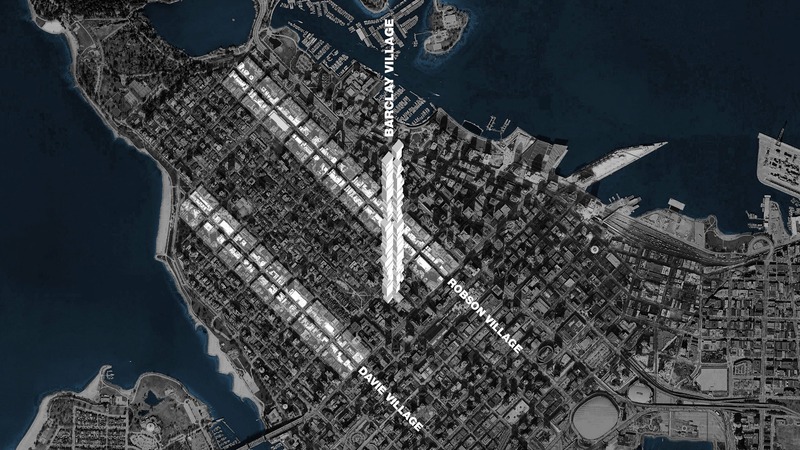 The twin towers are not conceived as separate entities but are closely connected with each other and the natural and urban spaces around them. Above the ground levels, a multi-layered bridge physically joins the two structures and creates a semi-internal courtyard that is both protected whilst remaining open to the street. 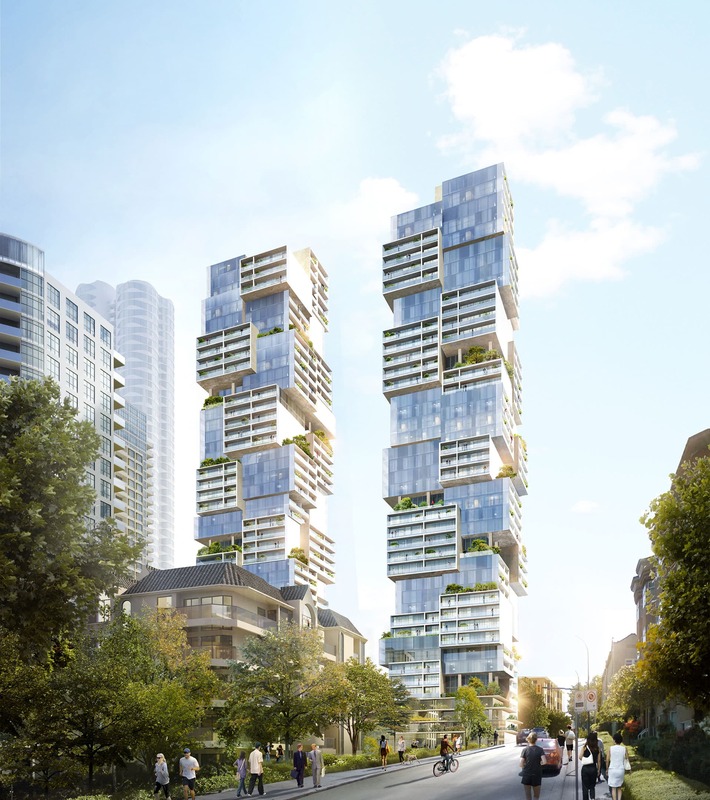 In contrast to the typical tower base with hard street edges and limited access, the design for Barclay Village proposes a softer, permeable approach with a series of receding plateaus that allow the surrounding greenery to overgrow them and fuse the structures into the streetscape.